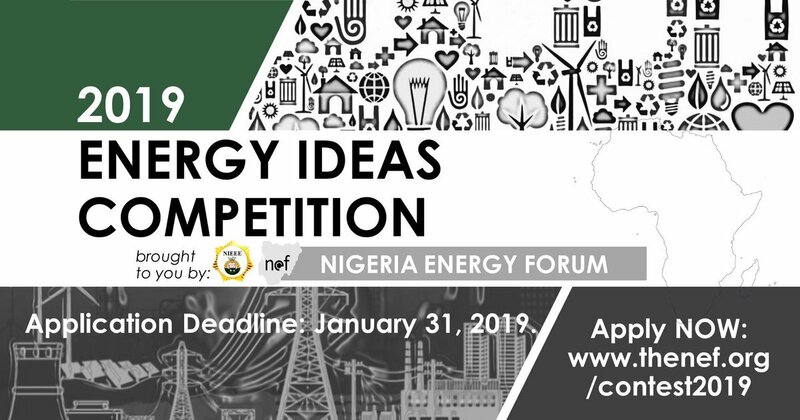 Nigeria Energy Forum (NEF) 4th Energy Innovation / Ideas Challenge Competition, Eligibility, Benefits, Application Guidelines and Deadline for 2019 [Win Investment Funds up to $5000]. The Nigeria Energy Forum (NEF) 4th Energy Innovation Challenge is set to upscale the development of early-stage energy firms across Africa. Across Africa, the main energy challenge is to rapidly deliver modern energy services to millions of households and businesses using sustainable and affordable energy technologies. This competition challenges early-stage energy entrepreneurs from Africa to collaborate with local research institutions or industries to develop practical and sustainable energy products/services/prototype models for a social enterprise or energy management system using local resources. Young professionals between the ages of 18 and 35 years from Africa are invited to participate in the competition and nominate a relevant local research institution or organization. Applications may be submitted by a team of up to three people. At least 1 member of the team must be from the local research institution or industry. Teams may be formed across different schools, institutions, companies, countries etc. Individuals or teams may submit multiple applications. 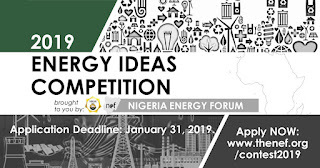 Pitch their proposed solution/service/prototype model at the 2019 Nigeria Energy Forum, in Lagos, Nigeria, using a poster and short 2-minute video. Benefit from unique networking opportunities with other young leaders as well as some of the most senior decisionmakers in government, international development, academia, and the private sector. Attend business development workshops, receive support from start-up incubators and cash investment prize of up to USD 5000 to demonstrate the proposed solution in the host community determined in collaboration with organizers. Submissions must be in Microsoft Word or PDF format by email to info@thenef.org. The subject line of the email should follow the format: [Country] Title of the Project. Submissions that exceed the word count may be disqualified. Shortlisted submissions would be invited to participate in the final round by submitting a 1-page poster to summarize their design, with a detailed budget, 2-page Design Brief, and a Short 2-minute video to describe a prototype model of the proposed solution.